LATEST MESSAGES from Entrants today..
Due to personal reasons I have decided to retire from the GGR 2018. Thank you for your support during the last few months. 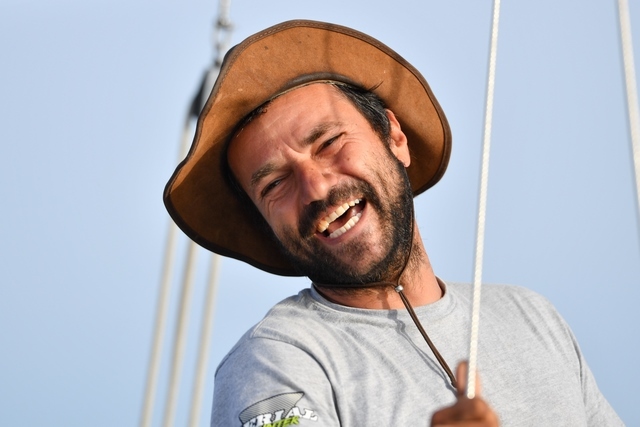 Francesco Cappelletti withdraws from the Golden Globe Race but joins the independent CAROZZO sailors. 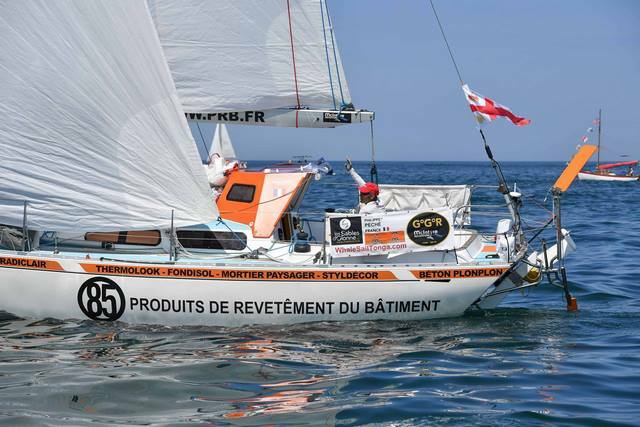 Entrants in the 2018 Golden Globe Race have set out from Les Sables d’Olonne, France on a solo, non-stop un-assisted circumnavigation without the aid of modern electronic navigation aids including GPS. 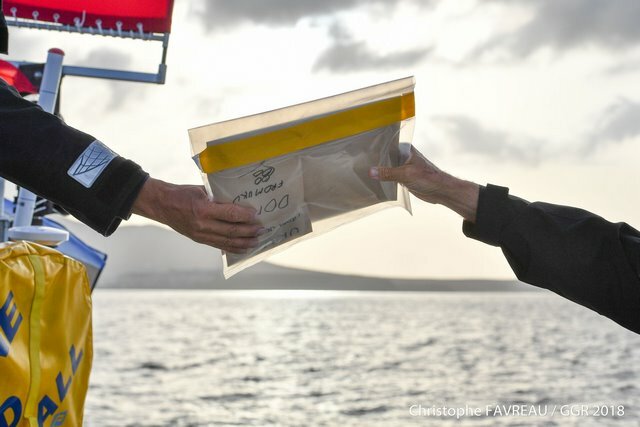 If any competitors breech one rule of the Race, such as stop-over for assistance, or use the emergency GPS stowed in a sealed case for emergencies, they are moved to the Chichester Class as if, like Sir Francis Chichester in 1966/7, they have made one stop during their solo circumnavigation. Those in the Chichester Class become ineligible for any GGR trophies or rankings, but remain in the event. 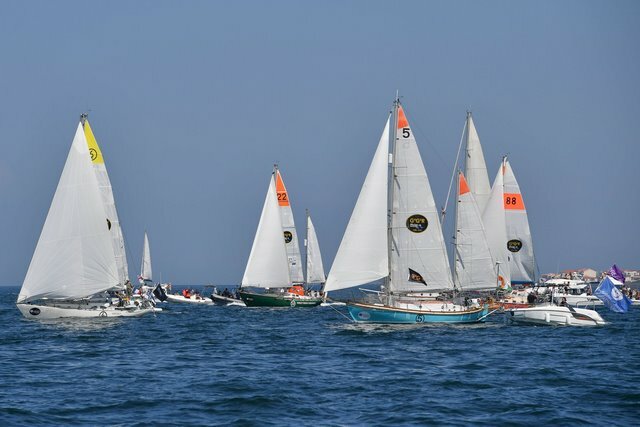 Should skippers breech the rules for a second time, they are no longer part of the GGR Event and the organisers have no responsibility or obligation to them. They will however continue to be tracked as independent CAROZZO sailors. 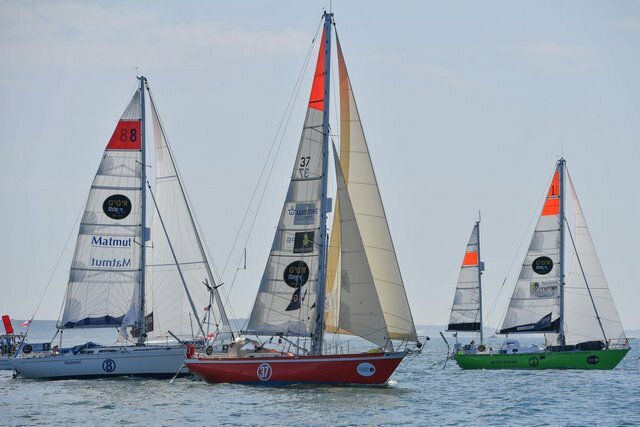 This is in deference to Alex Carozzo, the Italian entrant in the original Sunday Times Golden Globe Race who left Cowes on 31st October 1968 (the last day allowed within the Rules) and then sat in isolation on a mooring for a further five days finalising preparations on his boat before setting sail. Alex later suffered an ulcer and was forced to stop in Lisbon to seek medical attention. Today, fellow Italian Francesco Cappelletti has accepted that his Endurance 35 007 will not be ready before the the closing date for starting the 2018 GGR at 13.30hrs on Saturday 7th July. 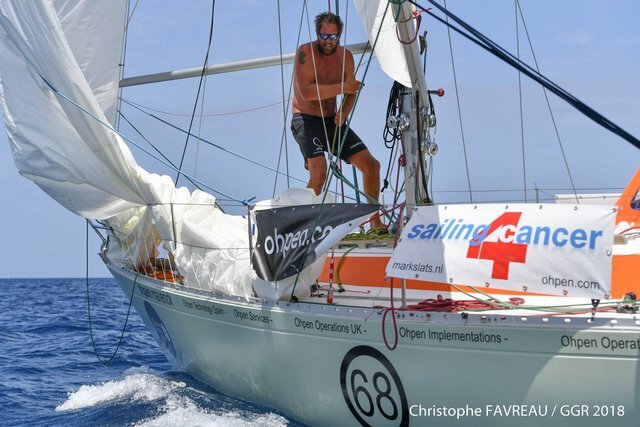 Instead, he will now sail as a CAROZZO sailor giving GGR sailors the opportunity to continue to follow their own dream of making a solo circumnavigation as a personal challenge with no restrictions on navigation equipment or gear including the use of GPS and their sat phone. 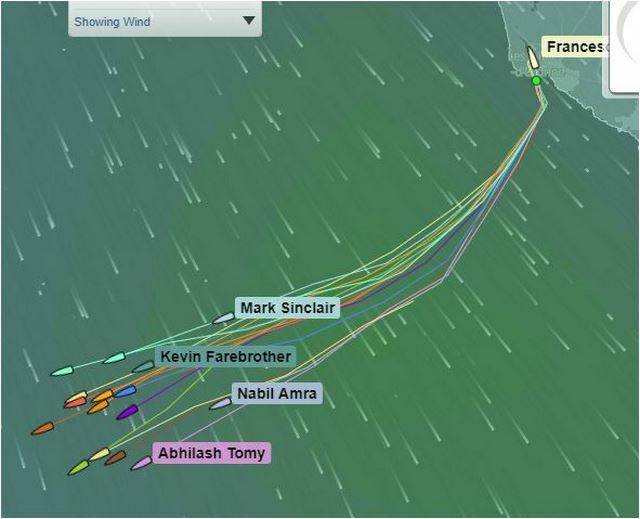 Their positions will be maintained on the GGR tracker and occasional reports may be given by the GGR organisers. 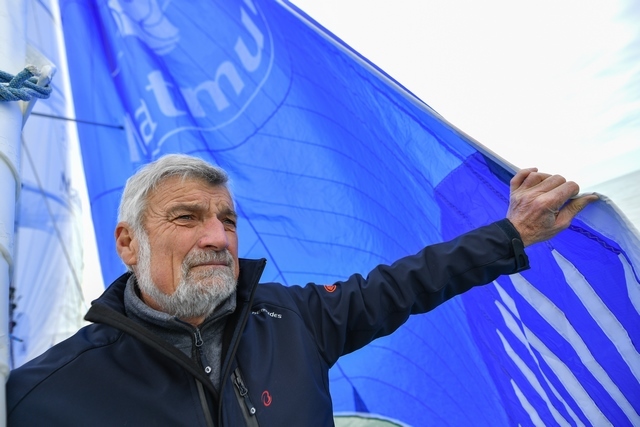 Cappelletti must set out from Les Sables d’Olonne by 13.30hrs on 21st July and his retirement from the main event reduces the entry list in the 2018 Golden Globe Race to 17 skippers. 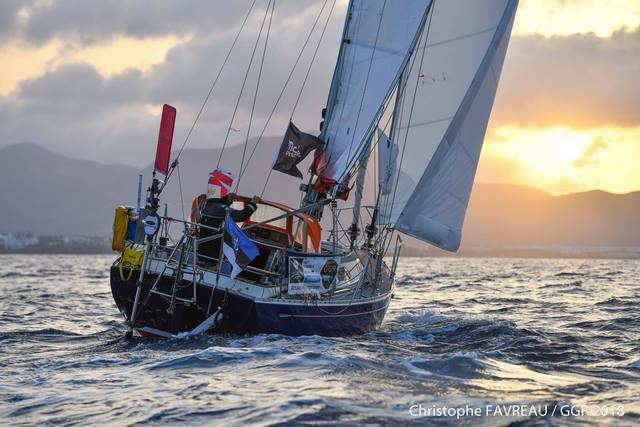 Don McIntyre, Chairman of the Golden Globe Race said today: “We are very sorry to lose Francesco. 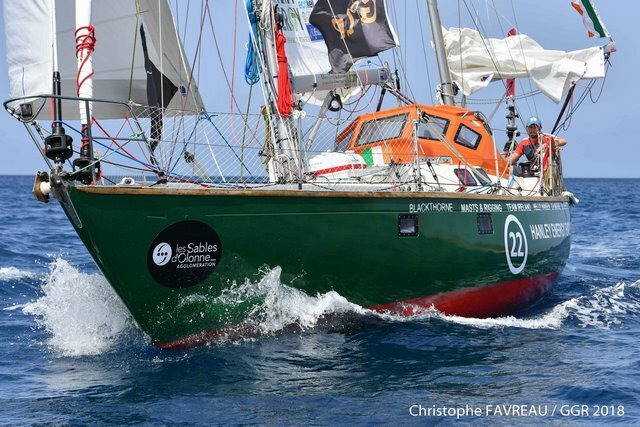 He is not now part of the GGR event but remains part of the adventure and will doubtless continue to stay in communication with the other GGR sailors. 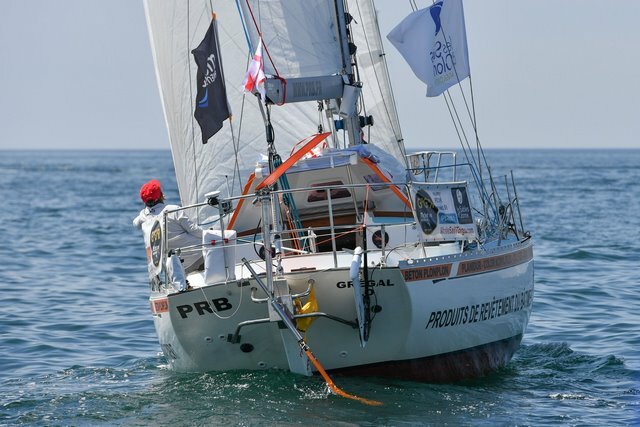 We hope he will return to Les Sables d’Olonne in time to attend the GGR prize-giving April 22"
The first four days of light, variable winds appear to have played into the hands of Golden Globe Race leader Mark Slats, the Dutch transatlantic rowing record-holder and his secret weapon – a pair of giant sculling oars. 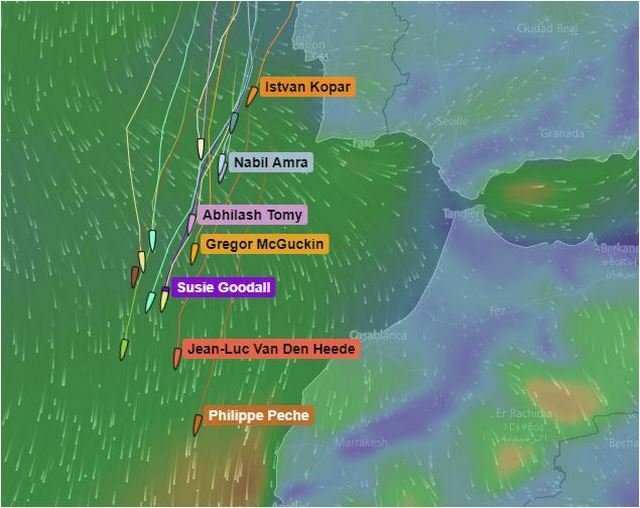 LATEST SATELITE TEXTS...the leaders are now breaking into a favourable wind flow and speeds will slowly increase for them as they break away from the rest of the fleet, still bogged down in variable winds. 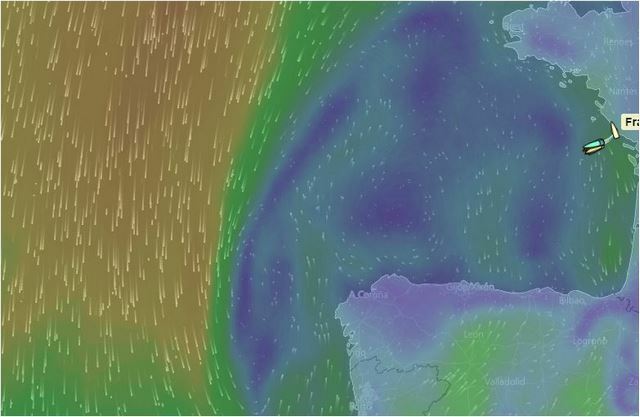 This will all change in the next 24 hours to see all yachts start moving in consistant winds. JL.VDH…PETIT TEMPS SOUS SPI TRANQUILLE MAIS LENT! ARE WIIG.. 7 I HAVE JUST TALKED WITH TAPIO, ALL WELL THERE AND HERE. Philippe P….85 THIS ALARM !S LOUD + ANNOYING WOKE ME UP IS IT A REMINDER ? 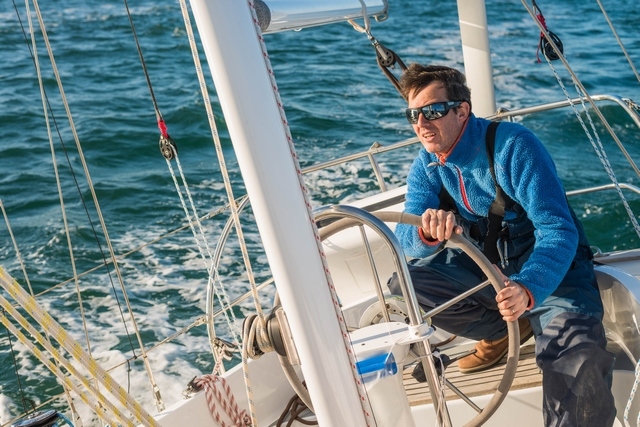 Skippers undergo cloud cover that prevents them from using their sextant for several days. 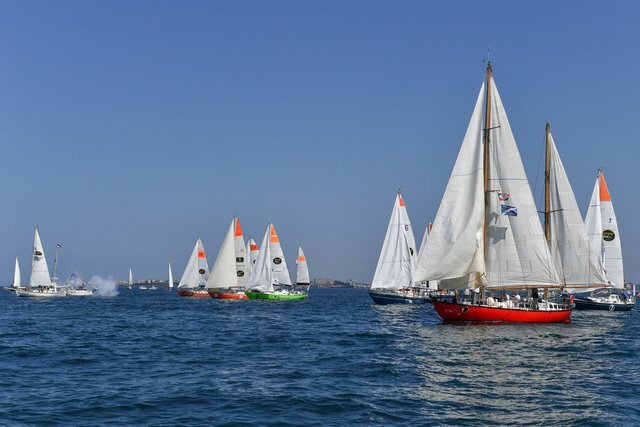 Navigation is at the moment at the compass and it will be interesting to see, if this cover is maintained, with what precision the skippers of the grh 2018 will move closer to the canary islands and the wet buoy off the Marina Rubicon , mandatory crossing point for all competitors. Baptized "drop point", these track marks are used to retrieve images on board, in super 8 format or in pictures on film.. 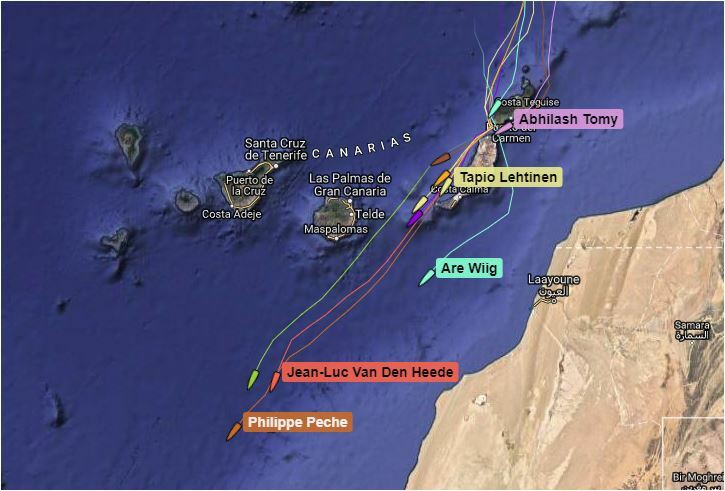 The height of the Canary Islands should help them find their way. Classification Side, no upheaval during the night. 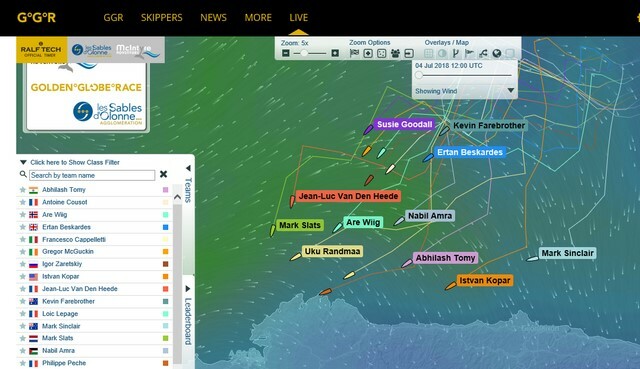 It should be noted, however, that itsván and recovered a little more wind from the coast. 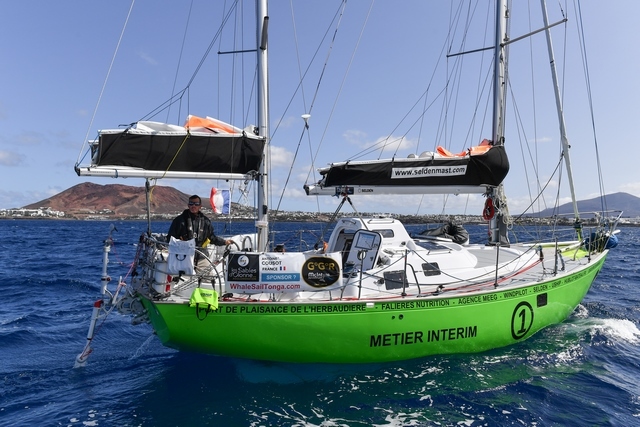 Igor and loïc also impress on their less performing boats... the weather forecasts, which showed yesterday a fall of the wind at the approach of the canary islands announced this morning a constant breeze to the archipelago. 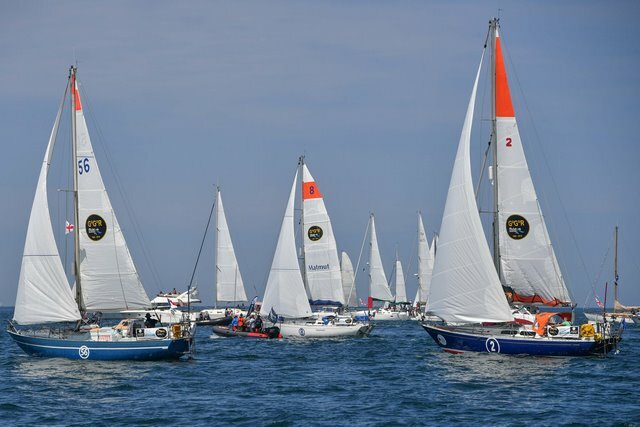 The first competitors could join the first crossing point (to leave between the wet buoy off the Marina Rubicon and the coast) on Thursday. 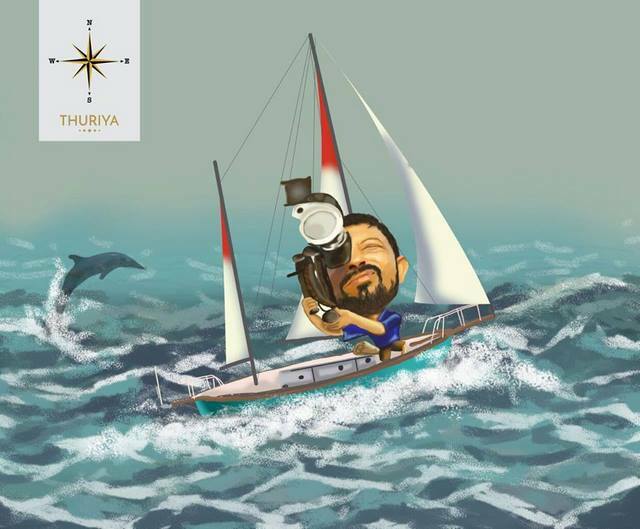 Part of the team 2018 team will be on site to host them and collect images of their passage. 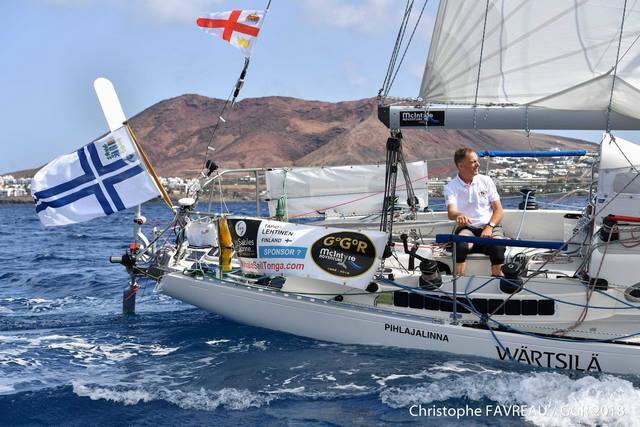 Live videos and photos of all boats are on the program... their arrival in Lanzarote will be in mid-afternoon today! The entire fleet of the 2018 continues to grow south. 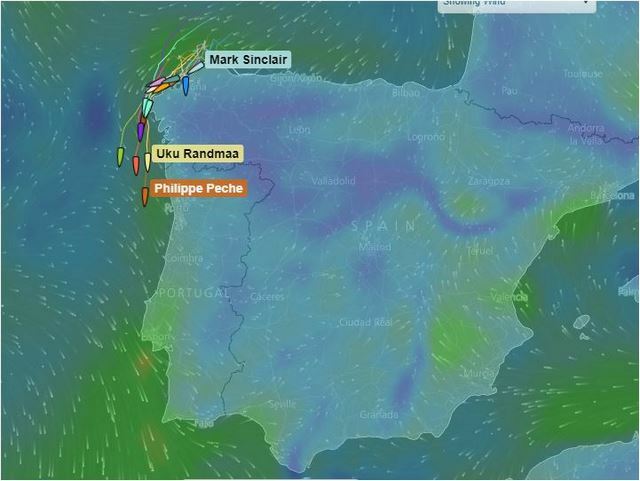 Leaders always show the most fast, Philippe sin firmly hung at over 5 knots of average and 155 miles travelled in the last 24 hours. It is expected at the canary crossing point early Thursday morning. Behind, vdh confesses a lot, the fault of an irregular wind. 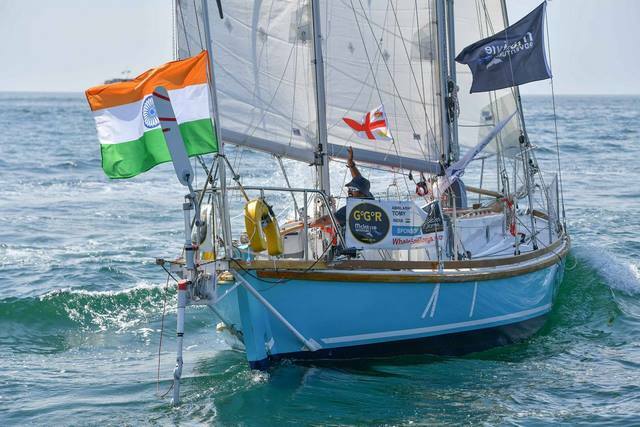 Other skippers like antoine cousot or abhilash tomy reported the strong presence of flying fish while tapio lethinen reported an infected injury to the hand that forced him to take antibiotics. 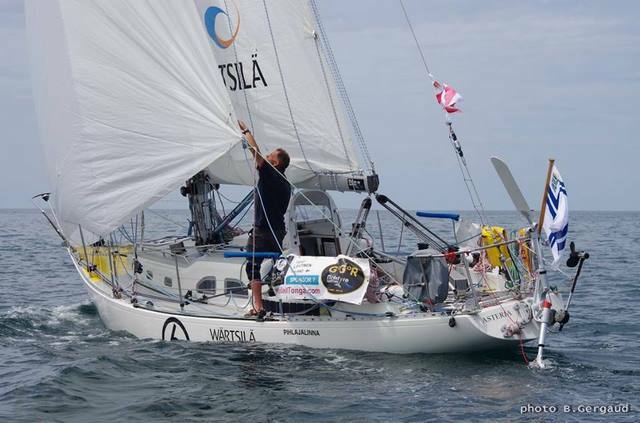 Bobo side, mechanical this time, Igor Zaretskiy entrusts that he is repairing the spi of his endurance 35, particularly speed in recent days. 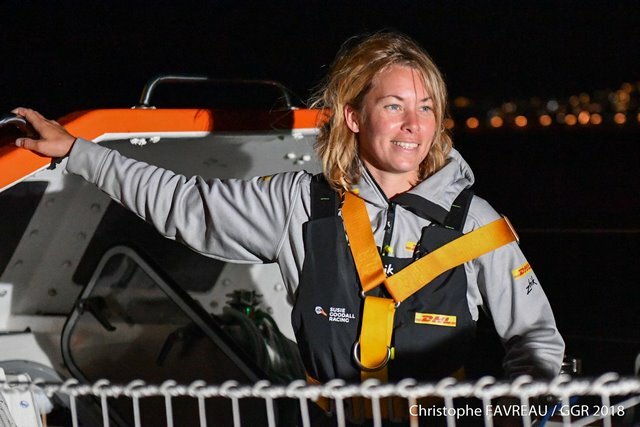 Are Wiig and Susie Goodall seem to have returned to a good pace, as has been seen at his expense uku randmaa, who got caught up. a chance to capture some media images and film of their own! 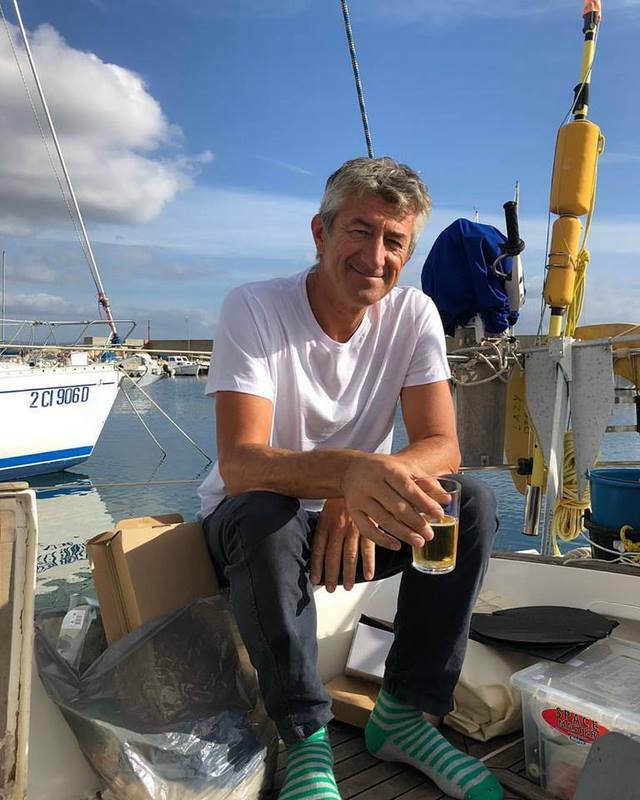 He is still in first place, but French Golden Globe Race leader Philippe Péché threw away a hard-fought 3½ hour lead at the first gate in this 30,000 mile solo non-stop round the world race today after mistaking the lighthouse marking the southern end of Lanzarote today. Why he missed the lighthouse’s distinctive pattern of flashes in the early dawn is not fully explained. If he had done so, Péché would have rounded the the mandatory turning mark at 06:30. Instead, it was 10:30 before he had passed across his film and letters to waiting organisers and had set off again. 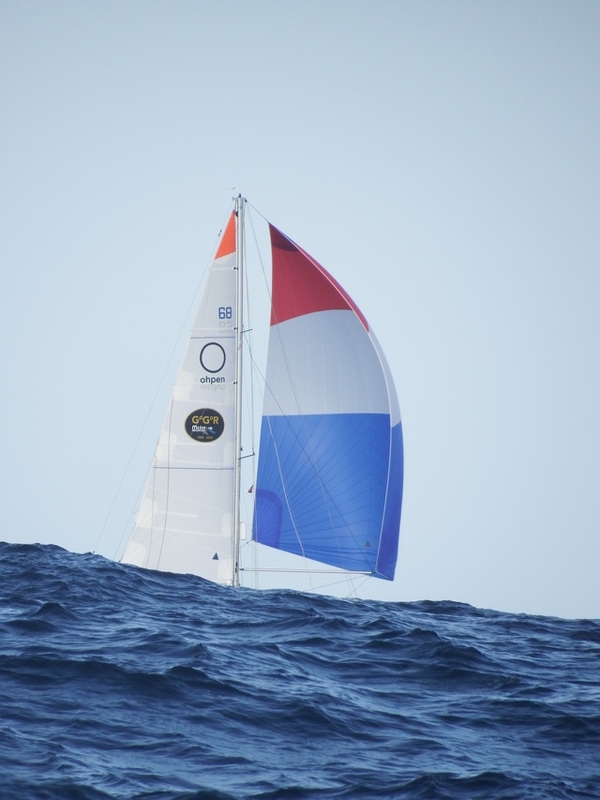 This time wasting closed the gap between himself and second placed Mark Slats and his Rustler 36 Ohpen Maverick to little more than 9 miles. The Dutchman was delighted. “I’m very happy and feeling strong. 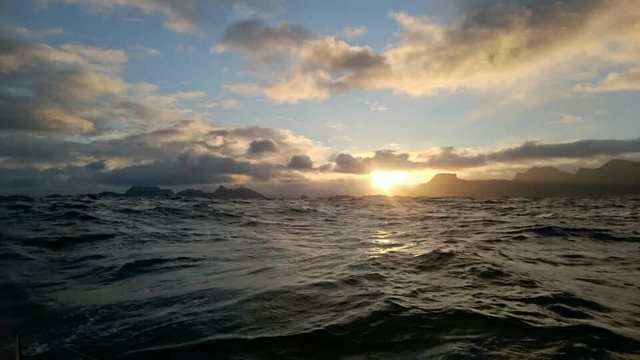 I rowed for 6 hours when the winds got very light around Cape Finisterre” he told organisers and after he too had handed across his film, and set off enthusiastically to chase down his rival. 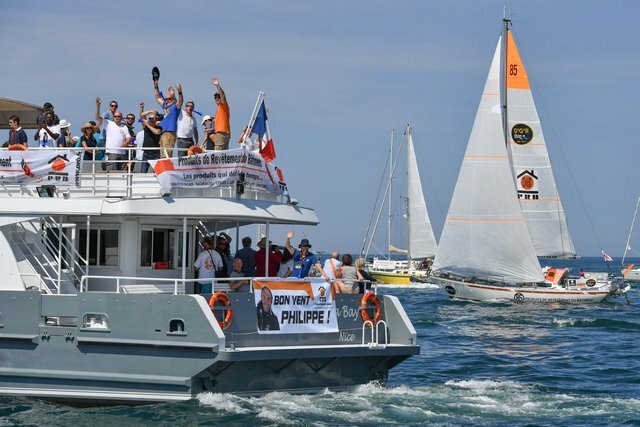 As the leading trio of Philippe Péché, Jean-Luc Van Den Heede and Mark Slats position themselves to cross the Doldrums, the dramas continue at the back of the Golden Globe Race fleet. 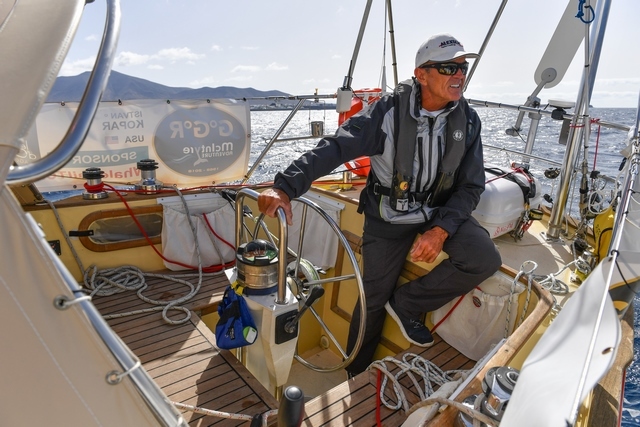 Nabil Amra, the US based Palestinian sailing the Biscay 36 Liberty II formally announced his retirement from the race today after reaching Tenerife overnight. 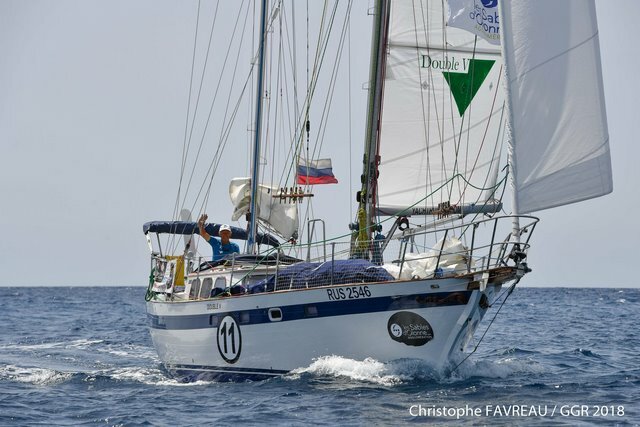 Fellow American Istvan Kopar has also announced that he intends to stop in the Cape Verde Islands to replace the self-steering system on his Tradewind 35 Puffin and join Frenchman Antoine Cousot in the Chichester Class for those who are forced to make one stop during their solo circumnavigation. 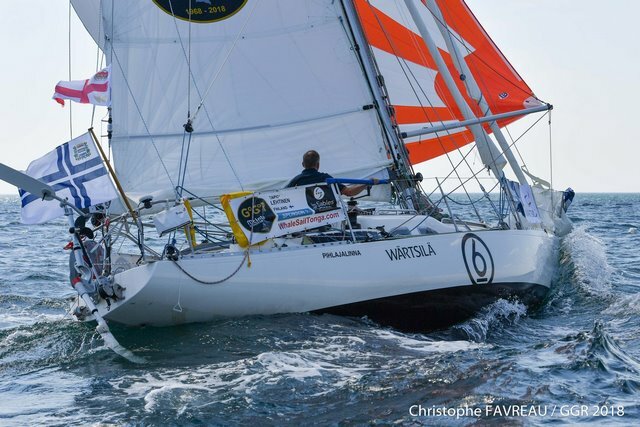 Forced to hand steer for hours on end due to failing self-steering systems led to exhaustion and frustration for Antoine Cousot (above) Istvan Kopar and Nabil Amra all pulling in to port. 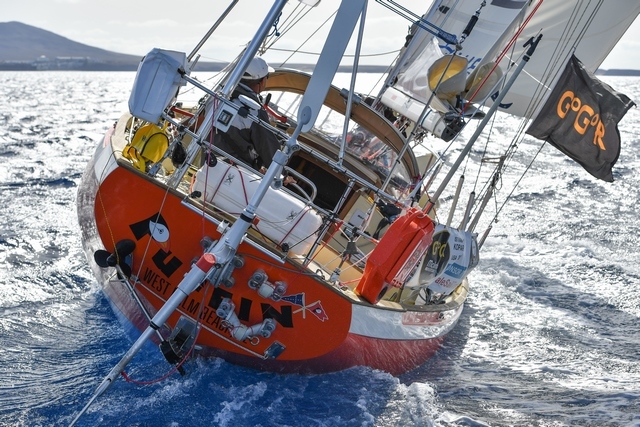 Disappointed - Kopar, who has already completed one solo circumnavigation, knows from experience that his yacht would never cope in the Southern Ocean in the way it is set up at present. 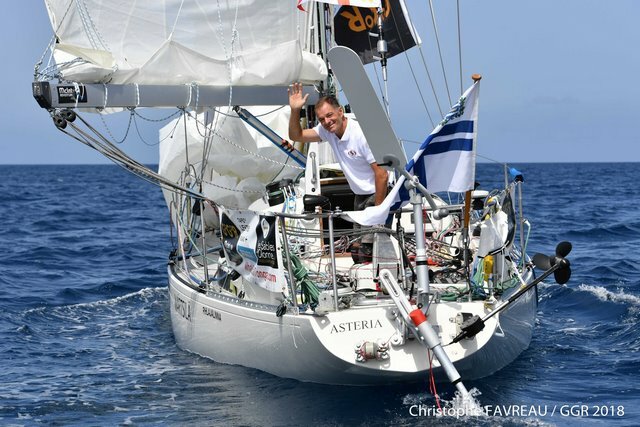 Cousot stopped in Lanzarote on Sunday complaining that his WindPilot wind vane steering could not control his Biscay 36 Métier Intérim, but after two days in port it became clear as he left Marina Rubicon on yesterday that his decision to drop down to the Chichester Class, was as much mental as mechanical. In a candid interview with Race Organisers, Cousot said: I needed the break just to relieve the pressure. It was important for me mentally to make sure that everything is working…And it was good to have a hamburger and a beer! 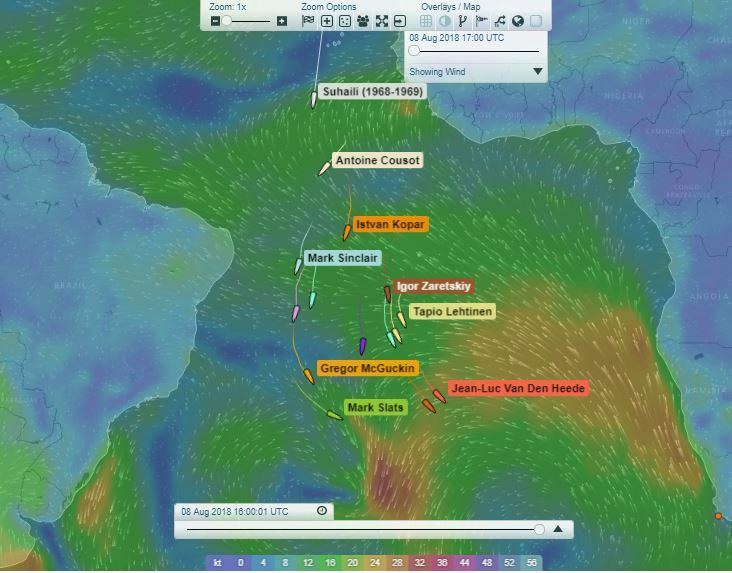 Back at the front of the fleet, Jean-Luc Van Den Heede has moved up to 2nd place and reduced fellow Frenchman Philippe Péché’s lead to 24 miles as they and Dutchman Mark Slats position themselves to cross the Doldrums, the area of calms that divide the North East and South East trade winds. 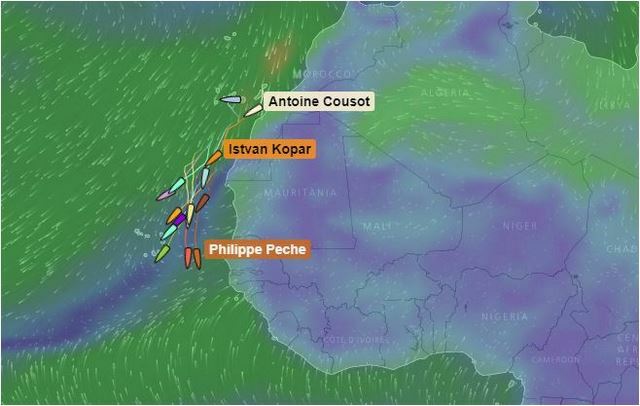 Péché’s Rustler 36 PRB is nearest to the Senegal coast, Slats (Rustler 36 Ohpen Maverick) who caught a tasty tuna today – his first fresh meat since the start – is enjoying stronger winds close to the Cape Verde Islands and Van Den Heede (Rustler 36 Matmut) is running a median course between them. 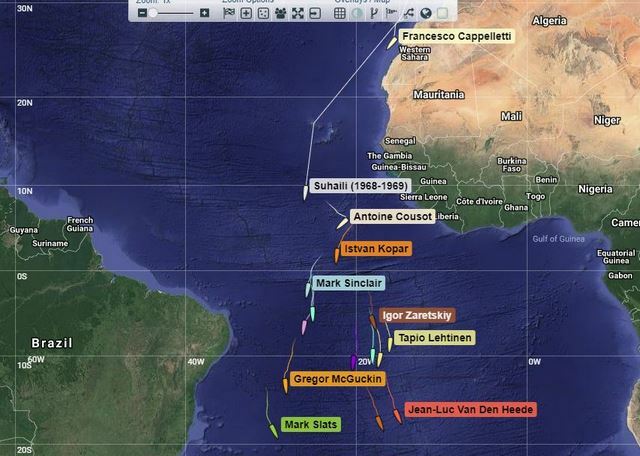 I suppose it's better to sort out problems before the Southern Ocean, but yikes, 1/3 of fleet already gone? Not sure about this old school thing. Hard to tell a story without the photos and video we have become used to.